In July this year St. ERHARD was nominated for the German Design Award 2014 and last week, as you might know, the winners were announced. Owing to its puristic bottle design St. ERHARD was exceptionally honored with a “Special Mention” Award. 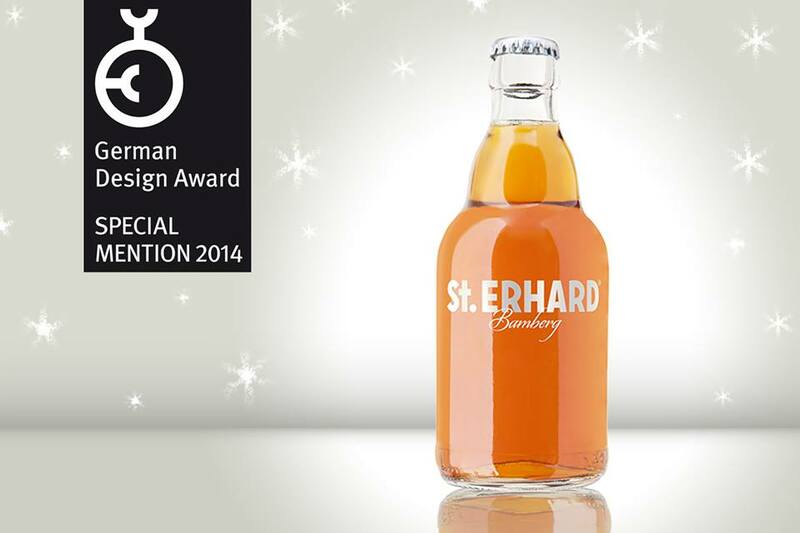 Thereby St. ERHARD is the only German beer brand, which won the German Design Award 2014. We are very delighted by that and say “thank you” to the German Design Council. Initiated by the German Federal Parliament and endowed by German enterprises, the German Design Council awards the German Design Award every year since 1954. An expert panel evaluates different products regarding their design or conception. Due to our remarkable and innovative bottle design we, as a young start-up, could win this highly coveted award. Our St. ERHARD beer comes in an unusual transparent, but UV-protected design bottle and the German Design Council acknowledged this deliberate reduction of our design, which highlights the amber-colored beer. With its special design St. ERHARD is a modern version of a traditional, delicious Franconian Kellerbier. Following the winner annoucement from last week, the official award presentation ceremony will take place at the 7th February within the Ambiente trade fair in Frankfurt/Main.